Mostaan, H., Poorkabirian, M., Rafiei, M. (2018). The Interface Structure in Dissimilar Welding of AISI 4130 to AISI 316L Steels Using ERNiCr-3 Filler Metal. International Journal of Iron & Steel Society of Iran, 15(1), 1-8. H. Mostaan; M. Poorkabirian; M. Rafiei. "The Interface Structure in Dissimilar Welding of AISI 4130 to AISI 316L Steels Using ERNiCr-3 Filler Metal". International Journal of Iron & Steel Society of Iran, 15, 1, 2018, 1-8. Mostaan, H., Poorkabirian, M., Rafiei, M. (2018). 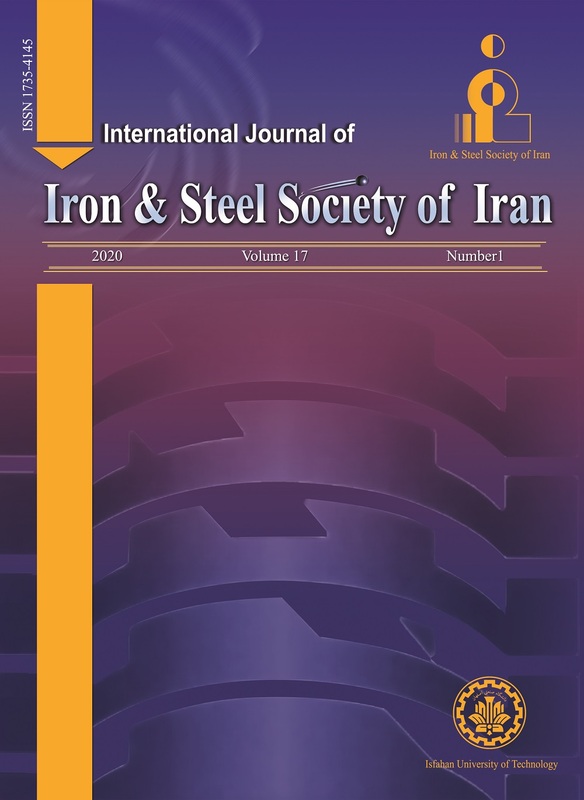 'The Interface Structure in Dissimilar Welding of AISI 4130 to AISI 316L Steels Using ERNiCr-3 Filler Metal', International Journal of Iron & Steel Society of Iran, 15(1), pp. 1-8. Mostaan, H., Poorkabirian, M., Rafiei, M. The Interface Structure in Dissimilar Welding of AISI 4130 to AISI 316L Steels Using ERNiCr-3 Filler Metal. International Journal of Iron & Steel Society of Iran, 2018; 15(1): 1-8. In this research the interface structure of dissimilar joint between AISI 4130 and AISI316L steels produced by GTAW process was evaluated. ERNiCr-3 was used as a filler metal for this joint. After welding the microstructure of different areas including weld metals, heat affected zones and interfaces were studied by optical microscope (OM), scanning electron microscope (SEM) and energy dispersive spectroscopy (EDS) analysis. It was found that the weld metal entirely has astenitic microstructure with relatively equiaxed grains and denderitic morphology. The results also showed that the grain growth in 4130 steel-weld metal interface was unepitaxial due to the severe difference in chemical composition between the base and weld metals. Microhardness measurements showed that the welded sample indicated the highest microhardness in the heat affected zone of 4130 steel because of the presence of tempered matensite and bainite in this area. In the weld zone a decrease in hardness value from AISI 4130 steel to AISI 316L can be seen. This reduction in microhardness can be due to the less amount of carbon in the weld area in vicinity of the AISI 316L base metal. H. Ghazanfari, M. Naderi: Acta Metall. Sin., 26(2013), 635. N. Kumar, P. Bhaskar, Y. Mastanaiah, P. Murthy: Procedia Mate. Sci., 5(2014), 2382. L. Ying Li, Y. Wang, T. Han, L. Chao: Inte. J. Mineral. Metall. Mater., 18(2011), 419. J. Lippold , C. Kotecki, D. j: Welding Metallurgy and Weldability of Stanlees, John Wiley & Sons Jercy Inc., New Jersey, USA, (2005). E. Bain, C. Paxton, W. H: Alloyig Elements in Steel,Second Edition, Third Revised Printing, American Society for Metal, USA, (1966). N. Arivazhagan, S. Singh, S.Prakash, G. M. Reddy:Mater. Design., 32(2011), 3036. M. P. Reddy, A. A. S. William, M. M. Prashanth, S. N. S. Kumar, K. D. Ramkumar, N. Arivazhagan, S. Narayanan: Procedia Eng.,75(2014), 29. C.Jang, J. Lee, J. S. Kim, T. E. Jin: Int. J. Pres. Ves. Pip., 85(2008), 635. J. W. Kim, K. Lee, J. S. Kim, T. S. Byun: J. Nucl. Mater., 384(2009), 212. E. Ahmadi, A. R. Ebrahimi: Adv. Mater. Proc.,1(2013), 55. H. Mostaan, M. Shamanian, M. P. Monirvaghefi, S. Behjati, J. A. Szpunar, J. Sherafati: Vacuum,109(2014), 148. G. S. Chander, G. M. Reddy, G. R. N. Tagore: Int. J. Adv. Manuf. Techn., 64(2013), 1445. N. Özdemir, F. Sarsılmaz, A. Hasçalık: Mater. Design., 28(2007), 301. W. E. White, W. E. May:Metallography,3(1970), 35. A. V. Kington, F. W. Noble: Mater. Sci. Eng.,138(1991), 259. M. Poorkabirian, H. Mostaan, M. Rafiei: J. Adv. Mater. Eng. (Esteghlal)., 36(2017), 33. S. Wang, Q. Ma, Y. Li: Mater. Design., 32(2011), 831. P. Bala Srinivasan, V. Muthupandi, W. Dietzel, V. Sivan: Mater. Design., 27(2006), 182.